When you added your first windows machine, you might notice that the memory is somewhat strangely formatted. You can find that transform, together with a CPU transform, here on my blog. 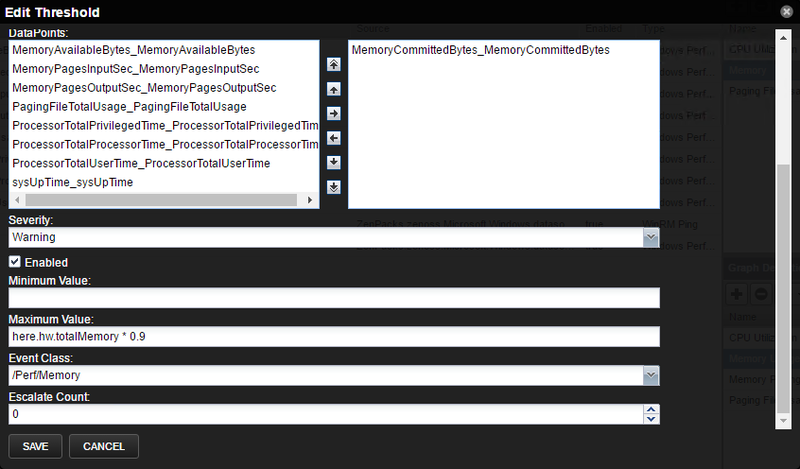 Secondly; you must change the memory threshold of component template that is in place on top of you device class. In my case; that is /Server/Microsoft/Windows. Click Infrastructure -> Devices and navigate until you have Windows devices shown and click on Details; that will show the templates that are in place in that specific device class. 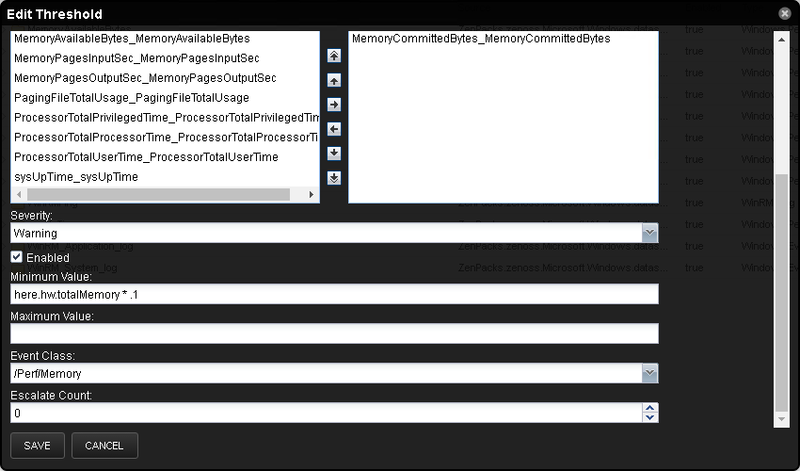 Then select the Device template on the left and edit the Memory threshold on the right. Default it is configured like the picture above. The problem with this is that it will calculate the maximum memory value based on its hardware and virtual memory… as a total; in my case 16 Gigabytes. And the maximum value is set 90% of the total hardware memory; in my case 8 Gigabytes. And that is where the problem lies. This will never work and should be adjusted. So if you follow the article here, that will fix this. Thank you for reading and till next time. The guide was focused on using BtrFS (because ZenOss 5 was using BtrFS in that version) and easy install by copy and pasting all the CLI commands. Everything was fine for quite a time, but after a while my disks where running full and couldn't find out what was causing it. So after troubleshooting with my limited Linux Skills, i decided after a few evenings troubleshooting, to throw it in the thrash and start all over again. The version 5.1.2 is configured with XFS filesystem. So, this post is based on the install and plan guide that is available by ZenOss. When i installed ZenOss i used the following hardware specs for my virtual machine, this is based on the planning guide of ZenOss. I choose to install it with a Minimal iso. Then mount the ISO to your machine. Personally; i uploaded it to a location on the Datastore and from there i mounted the ISO. Otherwise if you mount it via the Console Client, the ISO gets lost when you boot the machine, or when it reboots during install. 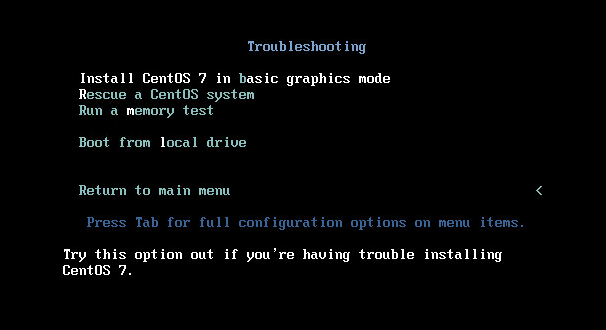 Also when you have problems with not seeing the fullscreen of the console during the install and/or buttons are missing ; you can solve this by installing CentOS via the Troubleshooting option. After reboot; log in and update system and reboot again. Read first! 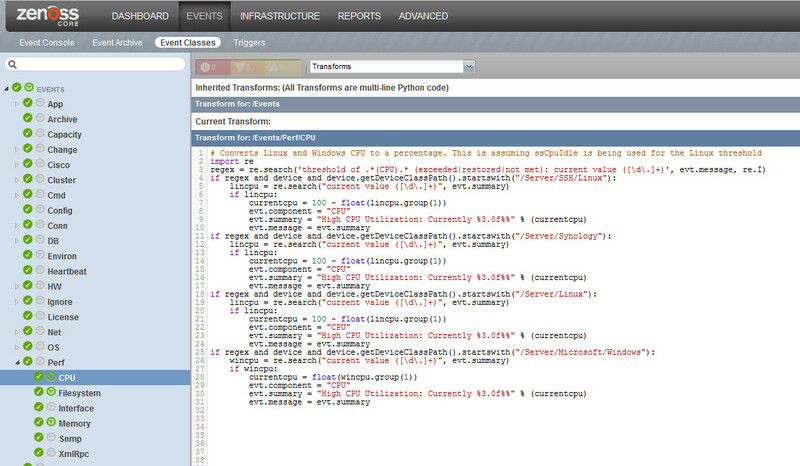 Then configure, otherwise you may mis important steps! A local partition for Docker data, configured as a device mapper thin pool. A local partition for Control Center internal services data, formatted with the XFS file system. A local or remote primary partition for Zenoss Core data, configured as a device mapper thin pool. A local primary partition, a remote primary partition, or a remote file server, for backups of Zenoss Core data. file system that is compatible with XFS. Control Center internal services data is not on the same device. Create XFS partitions for a local partition for Control Center internal services data, formatted with the XFS file system. Create XFS partitions for a local primary partition, a remote primary partition, or a remote file server, for backups of Zenoss Core data. The local primary partition is formatted with the XFS file system. Docker data and Zenoss Core Data are configured as device mapper thin pool, thus primary partitions; no actions needed here. For ControlCenter and Zenoss Core Data; we must create XFS file systems. 1 Log in to the target host as root, or as a user with superuser privileges. 2 Identify the target primary partition for the file system to create. the Zenoss Core Planning Guide. 3 Create an XFS file system. 4 Add an entry to the /etc/fstab file. 5 Create the mount point for internal services data. 6 Mount the file system, and then verify it mounted correctly. To perform this procedure, you need a host with at least one unused primary partition, or a remote file server. system for backups. For more information about primary partitions, refer to the Zenoss Core Planning Guide. 2 Optional: Identify the target primary partition for the file system to create, if necessary. Skip this step if you are using a remote file server. 3 Optional: Create an XFS file system, if necessary. 4 Create an entry in the /etc/fstab file. 5 Create the mount point for backup data. 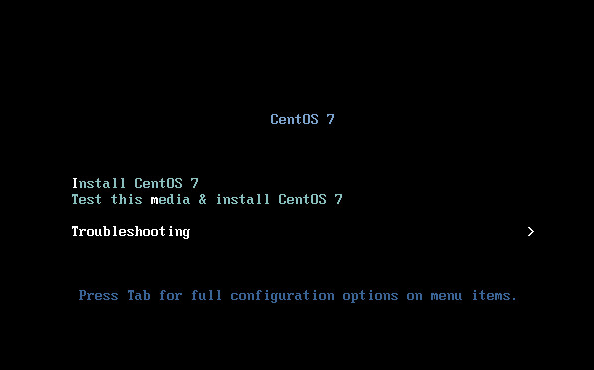 This procedure prepares a RHEL/CentOS 7.1 or 7.2 host as a Control Center master host. 1 Log in to the candidate master host as root, or as a user with superuser privileges. 2 Add an entry to /etc/hosts for localhost, if necessary. a Determine whether 127.0.0.1 is mapped to localhost. If the preceding commands return no result, perform the following substep. b Add an entry to /etc/hosts for localhost. 3 Disable the firewall, if necessary. a Determine whether the firewalld service is enabled. ■ If the result includes Active: inactive (dead), the service is disabled. Proceed to the nextstep. ■ If the result includes Active: active (running), the service is enabled. Perform the following substep. b Disable the firewalld service. 4 Enable persistent storage for log files, if desired. By default, RHEL/CentOS systems store log data only in memory or in a small ring-buffer in the /run/log/journal directory. By performing this step, log data persists and can be saved indefinitely, if you implement log file rotation practices. For more information, refer to your operating system documentation. 5 Disable Security-Enhanced Linux (SELinux), if installed. a Determine whether SELinux is installed. If the preceding commands return a result, SELinux is installed. b Set the operating mode to disabled. Open /etc/selinux/config in a text editor, and change the value of the SELINUX variable to disabled. c Confirm the new setting. 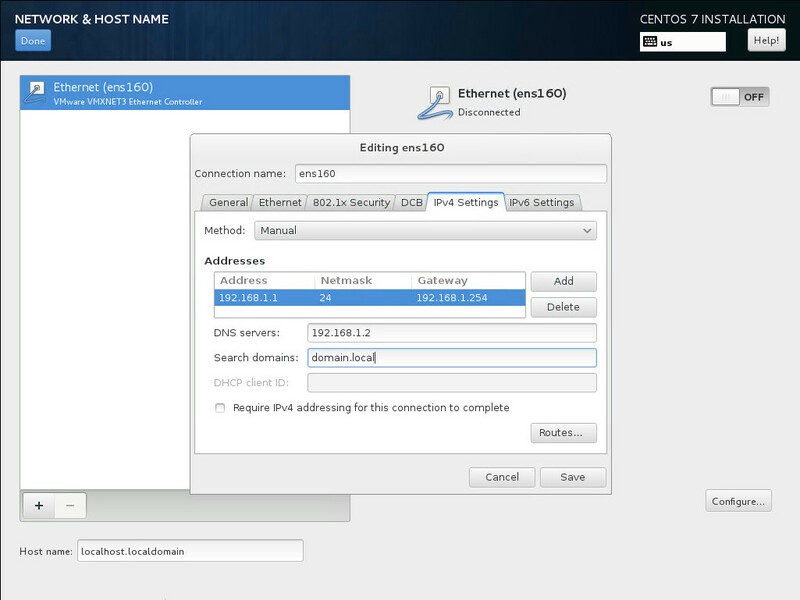 6 Enable and start the Dnsmasq package. 7 Install the Nmap Ncat utility. The utility is used to verify ZooKeeper ensemble configurations. If you are installing a single-host deployment, skip this step. 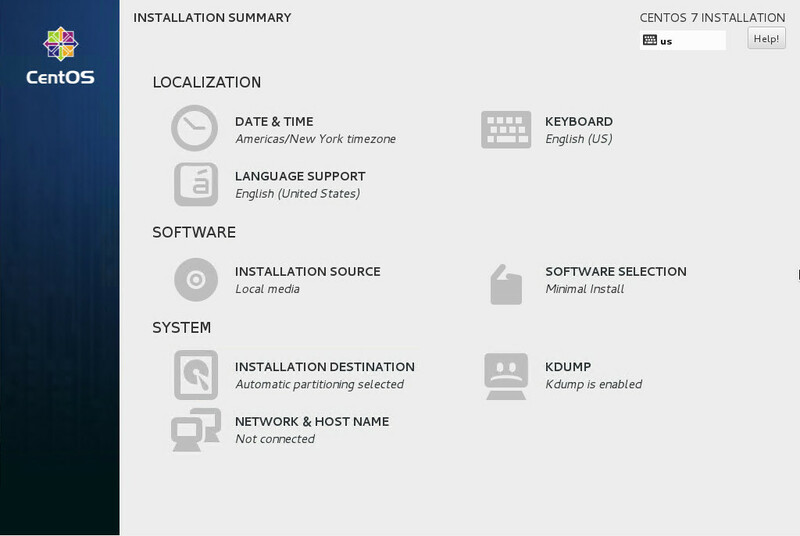 8 Install and configure the NTP package. b Set the system time. c Enable the ntpd daemon. d Configure ntpd to start when the system starts. Currently, an unresolved issue associated with NTP prevents ntpd from restarting correctly after a reboot. The following commands provide a workaround to ensure that it does. 9 Install the Zenoss repository package. b Clean out the yum cache directory. This procedure installs and configures Docker, and installs Control Center. 1 Log in to the master host as root, or as a user with superuser privileges. 2 Install Docker 1.9.0, and then disable accidental upgrades. a Add the Docker repository to the host's repository list. c Open /etc/yum.repos.d/docker.repo with a text editor. 3 Create a symbolic link for the Docker temporary directory. Docker uses its temporary directory to spool images. The default directory is /var/lib/docker/tmp. The following command specifies the same directory that Control Center uses, /tmp. You can specify any directory that has a minimum of 10GB of unused space. a Create the docker directory in /var/lib. b Create the link to /tmp. 4 Create a systemd override file for the Docker service definition. a Create the override directory. b Create the override file. c Reload the systemd manager configuration. Control Center includes a utility that simplifies the process of creating a device mapper thin pool. 6 Create a device mapper thin pool for Docker data. a Identify the primary partition for the thin pool to create. b Create the thin pool. On success, the result includes the name of the thin pool, which always starts with /dev/mapper. 7 Configure and start the Docker service. a Create variables for adding arguments to the Docker configuration file. The --exec-opt argument is a workaround for a Docker issue on RHEL/CentOS 7.x systems. b Add the arguments to the Docker configuration file. c Start or restart Docker. The initial startup takes up to a minute, and may fail. If the startup fails, repeat the previous command. 8 Configure name resolution in containers. Each time it starts, docker selects an IPv4 subnet for its virtual Ethernet bridge. The selection can change; this step ensures consistency. a Identify the IPv4 subnet and netmask docker has selected for its virtual Ethernet bridge. b Open /etc/sysconfig/docker in a text editor. c Add the following flags to the end of the OPTIONS declaration. character (") is at the end of the line. d Restart the Docker service. This procedure installs Zenoss Core and configures the NFS server. 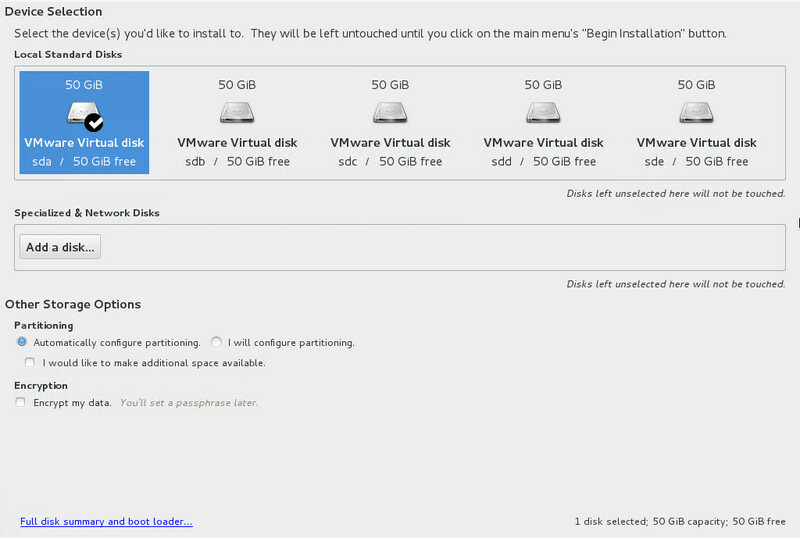 3 Configure and restart the NFS server. workaround to ensure that it does. a Open /lib/systemd/system/nfs-server.service with a text editor. 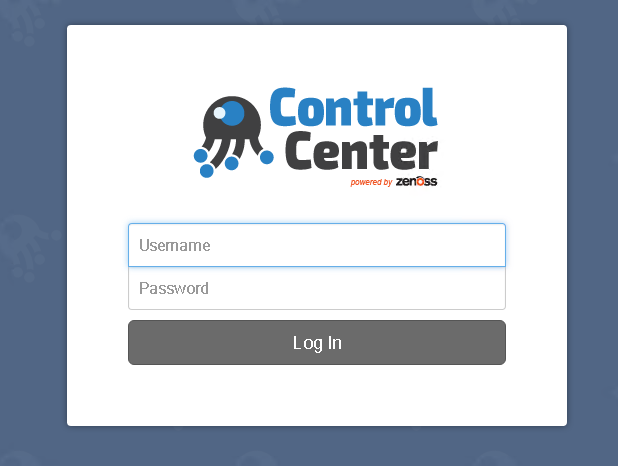 2 Configure Control Center to serve as the master and as an agent. services scheduler and other internal services, including the server for the Control Center browser interface. serviced instance in a Control Center cluster may be the master. a Open /etc/default/serviced in a text editor. b Find the SERVICED_AGENT declaration, and then change the value from 0 to 1.
c Remove the number sign character (#) from the beginning of the line. d Find the SERVICED_MASTER declaration, and then change the value from 0 to 1.
e Remove the number sign character (#) from the beginning of the line. f Save the file, and then close the editor. 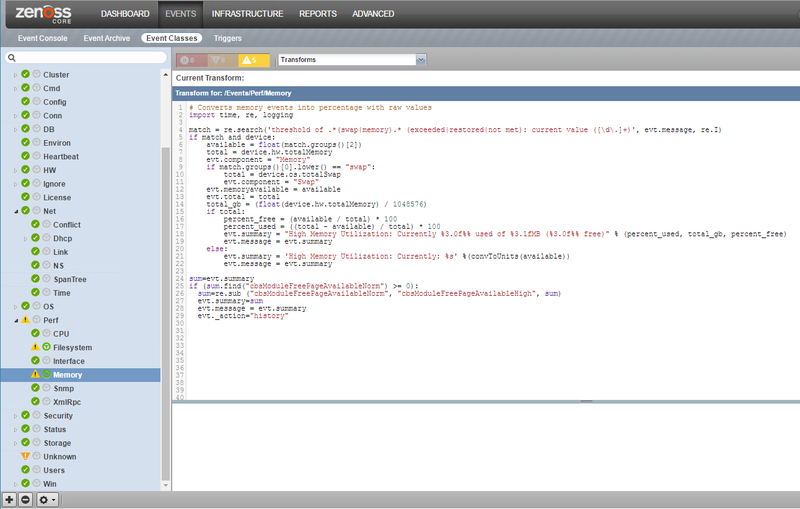 3 Create a thin pool for Zenoss Core data. refer to the Zenoss Core Planning Guide. 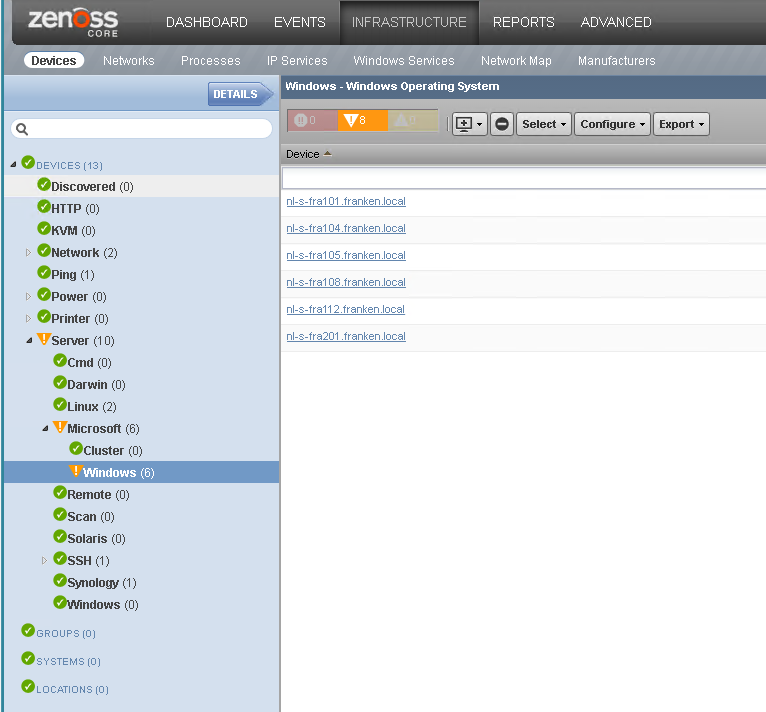 4 Configure Control Center with the name of the thin pool for Zenoss Core data. b Locate the SERVICED_FS_TYPE declaration. d Add SERVICED_DM_THINPOOLDEV immediately after SERVICED_FS_TYPE. e Save the file, and then close the editor. 5 Optional: Specify an alternate private subnet for Control Center, if necessary. valid, 16-bit, IPv4 address space for its private network. b Locate the SERVICED_VIRTUAL_ADDRESS_SUBNET declaration, and then change the value. d Save the file, and then close the editor. This procedure starts the Control Center service, serviced. pool repeats, Control Center is ready for the next steps. 3 Note Perform this step only if you are installing a single-host deployment. Optional: Add the master host to the default resource pool. an entry in /etc/hosts, or through a nameserver on your network. application images from Docker Hub. 2 Add the Zenoss.core application to Control Center. On success, the serviced command returns the template identifier. Control Center pulls Zenoss Core images into the local registry. environment. For more information, refer to the Zenoss Core Configuration Guide. But wait! ; your ZenOss deployment is not started yet. After that start your deployment by pressing the play button. In my case; it is already running.